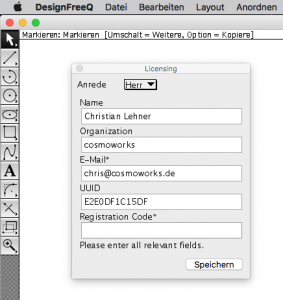 To purchase DesignFreeQ, please first download one of the demo versions, then contact us at info@cosmoworks.de to purchase the registration code for 129€. The registration code binds the app to one specific computer. Please make sure to send us the UUID from the Help/Activation dialog and we will generate and send you the registration code to activate DesignFreeQ on your computer. Once you receive the registration code, enter it below the UUID in the Help/Activation dialog to enable saving and printing in DesignFreeQ. To purchase a dongle, please let us know at info@cosmoworks.de and we send you an USB stick which enables DesignFreeQ on one Windows or Mac computer at a time. The dongle costs 299€. You can upgrade from registration code to dongle any time by paying the difference. The app store versions of DesignFreeQ are available from Apple or Microsoft. Should you require a Japanese version, please contact info@shark-designer.com to purchase dongle and CD from Japan for ￥54,000.